TCU Football - Game Day In Hi-Def! This will take your Horned Frogs game days to whole new heights. Under Chancellor Boschini's leadership, Texas Christian University has achieved monumental accomplishments and yet continues to raise the level of expectations. With the announcement of various capital projects, including a medical school and new Neeley School of Business, expanding Amon G. Carter Stadium is another illustration of the University's commitment to achieving excellence. The expansion project aids our ability to excel in a power athletic conference while also strengthening the TCU experience and campus culture. TCU Football has set the standard as a model college football program. The landscape of college athletics continues to be more competitive. Following the tenth 11-win season under head coach Gary Patterson, it is imperative we continue to reinvest in our facilities. The $100 million donor funded project prevents the University from taking on long-term debt and generates additional athletic revenue to provide resources for other areas in the department. 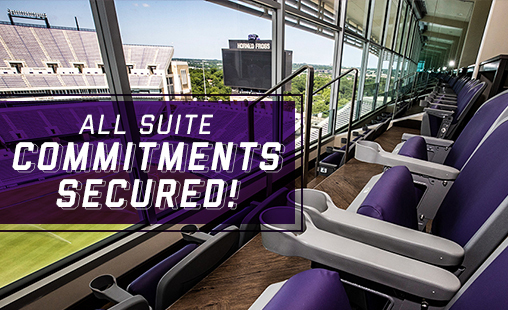 In a recent survey sent to season ticket holders and Frog Club members, of 1,866 respondents, 73% expressed interest in club seating, 45% expressed interest in loge seating, and 20% of those respondents expressed interest in a luxury suite. With an extensive waitlist, this project will provide new opportunities to engage with our community and offer seating inventory not currently available. Additionally, a new state-of-the-art LED video board will be installed in the north end zone, enhancing the viewing experience for all fans. The project includes the addition of 22 Legends Suites, with personal high-definition wall screens, access to private food and beverage service, and the most stylish luxury suite level in college athletics. 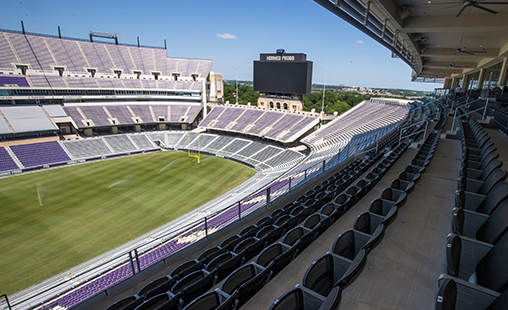 With fully operable tempered glass, suite holders can enjoy the full Amon G. Carter Stadium experience or lower the glass to watch the game from climate controlled comfort. A new premium product will be offered with the addition of 48 Legends Loge Boxes. Located on the same level as club seating, the Legends Loge Boxes will be evenly split between the north and south ends (approximately from the 5-yard line to the back of each end zone). Loge box seat holders have access to a private loge club at the top of each section and the Legends Club. The Legends Club is set to be one industry's most advanced and technology savvy premium seating spaces. The area features catered buffet-style dining, cash bar, private restrooms, and mobile furniture to accommodate groups of all sizes. Full glass windows showcase the best sight line in the city overlooking TCU and downtown Fort Worth. All fans inside Amon G. Carter Stadium will have an enhanced viewing experience with the addition of a brand-new LED video board located where the current structure sits today, in the north end zone. The video board will be installed following the completion of the 2018 season and be fully functional for the 2019 season. TCU has partnered with the original architect of Amon G. Carter Stadium, HKS Architects, to ensure symmetrical integrity of the design. 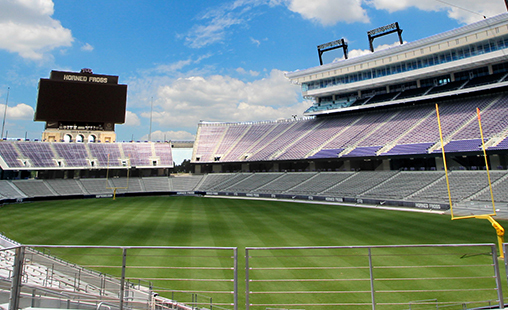 Completely rebuilt in 2012, the home of TCU Football has become one of the premier venues in intercollegiate athletics. The expansion project further cements our commitment to provide an unparalleled fan experience. How much does the project cost and how will it be funded? The total estimated cost of the expansion project is $100 million and will be privately donor funded. The start of construction is scheduled for June 2018 with the project being completed in August 2019. Will my 200 level seats be affected? No, this is strictly an expansion project. East side seating will remain fully intact for the 2018 season and the 2019 season. How will Legends Loge Box and Legends Club Seat selection be determined? The capital project gift amount will be the first factor to determine priority. 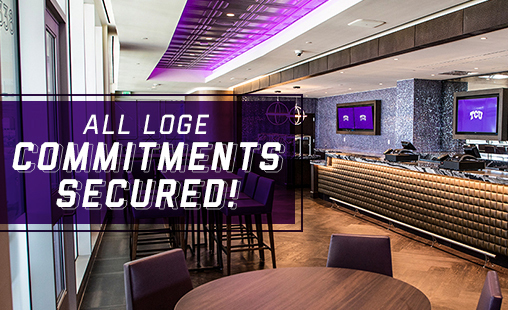 In the event two Legends Loge or Legends Club seat holders have pledged the same amount, priority will be given based on your Horned Frogs Priority Points System rank. Agreements will only be offered and signed if seating inventory is available. To help contribute to the Amon G. Carter Stadium fundraising efforts, please contact the TCU Frog Club at 817-257-7700. Gifts can be made in one payment or 5-year pledges that can be set up annually, quarterly, or monthly to suit your needs. How does the recently passed tax legislation affect my Horned Frogs Priority Points or tax deductibility for gifts to the project? The capital project gift agreements provide the choice to accept or refuse priority points. Please consult your tax advisor regarding the deductibility of any gift, especially if any portion of your gift was made to TCU Athletics or otherwise qualified you for the right to purchase athletic tickets. Is a new video board included in the project? Yes. A brand new state-of-the-art LED video board will be installed prior to the 2019 season. How will construction affect TCU Football home games in 2018? The construction will not impede on any stadium seating, however, temporary construction zone entrances will be set up on the east side of the stadium.